hrm.... i need a wood stove. 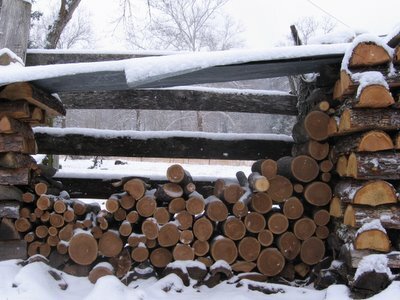 i want to chop wood for a fire... its good hard work that keeps you young and limber. When I see all these pics..just love the life your are leading in your farm.You are fortunate..blessed! Firewood:) Love it. What a wintery paradise you must be living in now. It snowed here on Friday-like really snowed-and it was so beautiful. Whenever it's forecasted to snow here in the city it never really does. Well... I was all stressed out. My life was filled with all kinds of things to do, but then I took my 10 min. at Farmgirl Fare. Now I'm ready for anything! Um, no. Never cut wood in the snow. Also, never driven in the snow. Or checked the mail. Or....the list could get really long. I'll stop now. Every day I'm grateful for so many things about living here. Hmmmm. How quickly do we go through a cord of wood? That's hard to say. I'd estimate we use about 10 cords during the winter, but Joe would say it's more (and if it is, I don't want to know). In the new building that is under construction (which will house our bread bakery along with us in an apartment above the bakery), we have installed a massive Charmaster wood furnace. We'll be heating a much larger space, much more efficiently (can you say 'central heat?' Yippee!) and figure we will be using 50% or more less wood than we do now. Yes, we are extremely excited. So nice to hear from you. I bet NYC is beautiful right after a big snow.